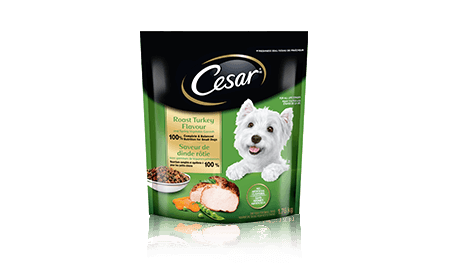 CESAR® Roast Turkey Flavour and Spring Vegetable Garnish is rated 4.3 out of 5 by 54. Rated 5 out of 5 by SASHADON_368229721 from My dog loved this food! He is generally very picky when it comes to dry food, but he gobbled it up so fast! Normally he sniffs at his dry food, eats a bit, then leaves it to come back and continue eating later. I have had to mix in some canned food to spike his interest. With this food, there were no issues- took to it right away! I have transitioned him to this food, and both he and I couldn't be happier!  I love that it offers 26 essential vitamins and minerals, and that it is a good source of dietary fibre, supporting digestive health! Rated 3 out of 5 by LILYNQC_368237295 from I couldn't find the coupon, but went and bought the food myself from the store at regular price. For my dog's regular food, I normally mix a bit of meat into his bowl or else he will not eat his dog food. I tried to feed him Cesar's turkey mix without meat and it did not catch his interest. But it not make him sick to switch from his regular food, so in a pinch I would buy Cesar because the price point is good and the accessibility is good. Rated 3 out of 5 by BASIASMB_368303289 from My dog typically gets very excited about something 'different'. This time, the food sat in his bowl most of the day And when he finally went to eat it, he played with it first and pawed out some pieces out of the bowl. There didn't seem to be a pattern but there was something he didn't like apparently. Rated 5 out of 5 by KIMBERLEACNS_368228805 from Im so glad they have finally come out with a dry food! I feed both wet and dry food to my dog in the run of the day. A bit of both. My dog absolutely loves cesars wet food. And now that we can also feed her the dry food from Cesars she is at the dish in no time at all. Great product! Rated 5 out of 5 by BONNIECNB_368233763 from Cesar, roast turkey,apple and carrot flavor, was a big hit with my fur babies! One of my senior dogs has had issues chewing her regular dry food but the Cesar is much easier for her. Very impressed with the quality ingredients! I now feed my girls Cesar regularly. Rated 3 out of 5 by NOLAJSK_368244903 from My dog really liked the product and gobbled it up. He then threw up shortly after eating the food and then had a couple boots of diaherra. I tried the food again a few days later in a smaller portion and the same thing happened. Sorry. Rated 3 out of 5 by ROSEWON_368239745 from MY pet absolutely loved this food and now wont eat anything else. He is so happy that he will dig through other dry food to find this brand. But I do mix this with a higher brand dog food as it does have a lot of fillers in it. If feeding CESAR® Roast Turkey Flavour and Spring Vegetable Garnish dry dog food for the first time or changing formula, we suggest you blend increasing amounts of the new formula with your old dog food for 7-10 days. CESAR® Roast Turkey Flavour and Spring Vegetable Garnish for small dogs is formulated to meet the nutritional levels established by the AAFCO dog food nutrient profiles for all life stages. CHICKEN MEAL, CORN, BREWERS RICE, CHICKEN BY-PRODUCT MEAL, WHEAT, ANIMAL FAT (PRESERVED WITH BHA & CITRIC ACID), DRIED BEET PULP, SOYBEAN MEAL, RICE FLOUR, FLAVOUR, VEGETABLE OIL (PRESERVED WITH BHA & BHT), GLYCERIN, SALT, TAPIOCA STARCH, POTASSIUM CHLORIDE, DRIED PEAS, FISH OIL (PRESERVED WITH MIXED TOCOPHEROLS), CHICKEN, CARAMEL COLOUR, GELATIN, MONOCALCIUM PHOSPHATE, CHOLINE CHLORIDE, POTASSIUM SORBATE, VITAMIN E SUPPLEMENT, DRIED CARROTS, ZINC SULPHATE, MONO & DIGLYCERIDES, BHA, BHT & CITRIC ACID, CHLOROPHYLL, NIACIN SUPPLEMENT (VITAMIN B3), IRON OXIDE, NATURAL ROASTED TURKEY FLAVOUR, COPPER SULPHATE, D-CALCIUM PANTOTHENATE (SOURCE OF VITAMIN B5), RIBOFLAVIN SUPPLEMENT (VITAMIN B2), SODIUM SELENITE, PYRIDOXINE HYDROCHLORIDE (VITAMIN B6), VITAMIN A SUPPLEMENT, TURMERIC, THIAMINE MONONITRATE (VITAMIN B1), FOLIC ACID, BIOTIN, VITAMIN D3 SUPPLEMENT, POTASSIUM IODIDE, VITAMIN B12 SUPPLEMENT.